I was on a mission today, and it was to try this infamous cheesecake at Jak’s cafe in Walton Street. 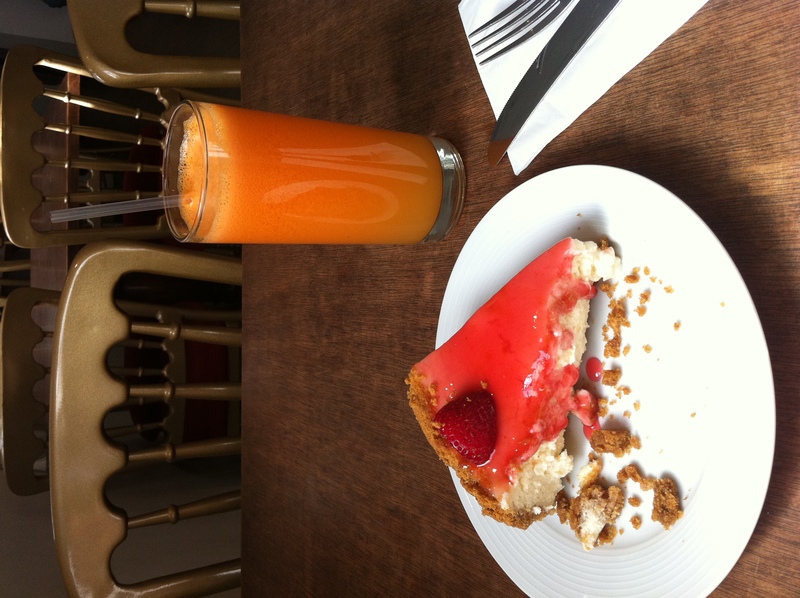 This cheesecake is supposed to be THE BEST in London and that’s a HUGE claim, on the food blogging world. It was a bit of struggle looking for the place google maps seems to failing me these days, but I knew if I can find bibendum then Walton street would be a easy find. Jak’s has two separate venues the bar and the cafe, I stumble across the bar venue first and thought it was weird to see an empty room. I whipped out my iPhone and asked “do you do the strawberry cheesecake here?” the man said “no”, I then had to show the guy the website and he replied “o that’s our cafe, a few doors away” Hurrying along I walked into to a counter with Mediterranean food prepared, I didn’t pay much notice to the food. It was a hot day all I wanted was that cheesecake and maybe tea. Then I saw the juice bar, it was a magnificent sight to see colours everywhere, all the fruit and veg on display looked healthy and vibrant a quick glance at the menu I saw that the fruit juice was priced at £3.50 to have in. The guy behind the juice told me I can put any combination of fruit and veg into my juice, that’s a plus in my perspective some places charge all sorts. I stuck with the safest combination I grown to love carrots, apples, oranges and ginger. The guy told me to take a seat and they would bring my juice and cheesecake to me. I choose a spot where no one else was seating as I wanted to take photo’s of the food without getting funny looks. The cafe is open planned, you get to see the shop front and cooks making food, if you do go to the loos you get see the kitchen too! I was over the moon and hyped up for the strawberry cheesecake it finally came to me, it was such a pleasant sight to see the enormous portion. 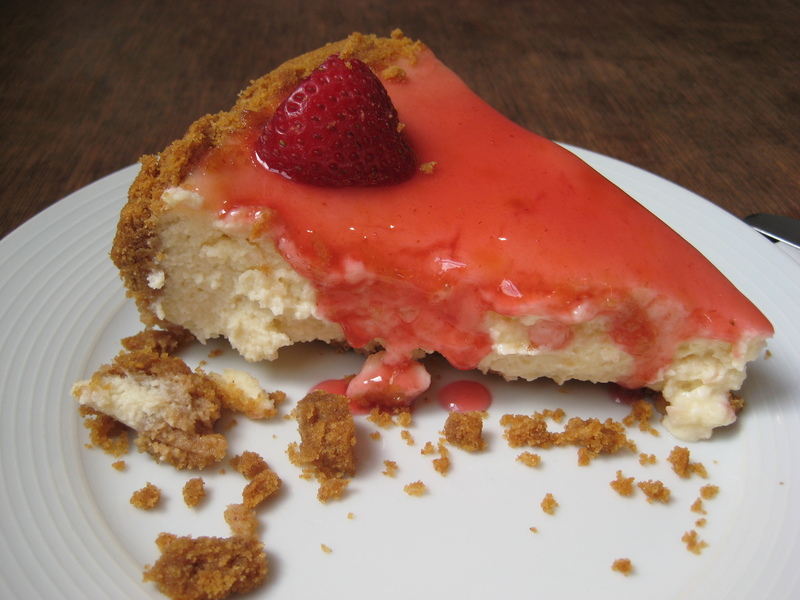 The strawberry syrup was slowing dripping onto the plate and the crunchy biscuit base falling apart. The cheesecake was very light, creamy and mouse like, nothing I tried before. The biscuit base was slightly soggy, but overall I was impressed of the quality and fluffiness of the creamy cheesecake part. The juice was very fresh the ingredients sourced tasted fantastic. The total bill was £8, dining in cost extra and apparently Prince Harry visits this place. I will need to pop in again to try the food. Sure wish I could get the strawberry cheesecake. It looks and SOOOOOOOOOO! Good. where is this place located at.